Indian president Pratibha Devisingh Patil expressed her admiration of Cambodia’s Angkor Wat in a recent visit. President Pratibha Devisingh Patil expressed wonder and amazement at the beauty of the 12th-century Angkor Wat temples, said to be Cambodiaâ€™s grandest legacy. The temples were constructed by Cambodiaâ€™s once mighty Khmer Empire, and have a great influence of Hinduism on its architecture. Angkor is one of the most important archaeological sites in South-East Asia and contains the magnificent remains of different capitals of the Khmer Empire, from the ninth to the 15th century. â€œAngkor Wat temple is considered one of the biggest in the world. 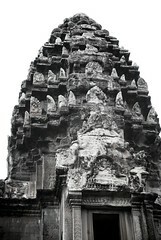 It was built in 12th century having historical and mythological importance. The temple architecture has been greatly influenced by architecture,â€ President Patil told ANI.